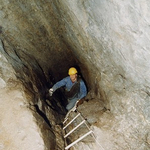 It is in the nature of a mine "to be underground". That is the fascination of a mine: Exploration and adventureism effects not only the children during their visit of the small world underneath the earth. The rendering of history is a very important part of such tours. Nowhere else does geology become so comprehendable as underneath the earth. For many hundreds of years the bluestone was extracted from mines. In the mid 1880's the slate mine of Recht was opened up in order to extract deeper and more profitable roof-slate-deposits. 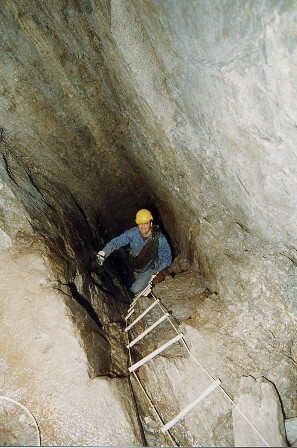 The extraction on the surface of the quarries had become too difficult because of the depth required. 1886 the work began in the upper shaft and from 1890 to 1895 the lower shaft was driven into the rock, which existed 60 meters underneath the earth's surface. The excavation was done by blasting with black powder. The lower shaft was successful only after reaching a depth of 300 meters, i.g. the slate-deposits were usuable slate. The extraction area covered a length of almost 100 meters and the massive excavation-chamber was in places more than 14 meters high. That is why people called the chamber "the cathedral". 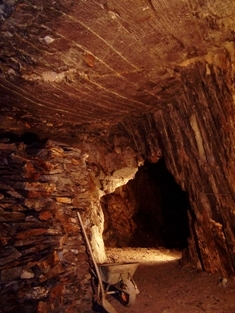 The excavation of the slate-plates worked almost the same as in the quarries. The stoneblocks weighing up to 750 kg were transported out of the mine on rail-tracks. Part of the rail-track can still be seen. One cannot talk of a bad climate in the slate mine of Recht as the temperature in sommer as well as in winter is a constant one of 7°C. The humidity reaches almost 100%. The lower as well as the upper shaft are connected by an airshaft, which is the cause for a constant "airflow". From the removed rock masses during the underground excavaton 80% could not be used for a high quality work. Before the 1. World War the underground excavation in the slate mine of Recht ceased. 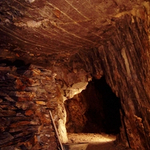 That the bluestone of Recht could not be used as roof-slate was probably one of the main reasons for closing the mine, it was not possible to cut the slate thin enough. The brothers Margraff employed up to 25 workers.